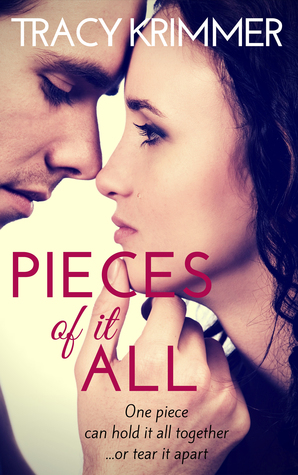 Pieces of It All gives readers a realistic look at young love. (Or should I say lust?) It took me back to a time when I wondered what it felt like to be in love and reminded me of all the times I realized what it wasn’t. Beth is a high school graduate preparing to head off to college. She’s book smart, responsible, and a good daughter and friend. She’s also innocent and naive. Harvey, on the other hand, comes from a broken family, is a recovering alcoholic, and is much more experienced with dating than Beth. When Harvey and Beth meet, there is an instant attraction. Beth tries to take things slow despite her intense feelings for Havey, but things end up heating up quickly. The story is told from the alternating perspectives of Beth and Harvey. I really liked Beth because she’s a good girl with a good head on her shoulders. Sure, there were times when her actions annoyed me, but this is a new adult novel, so I expected a few poor decisions that would ultimately lead to personal growth. I felt that her thoughts and actions were realistic for a girl her age. For example, she followed her heart against the advice of family and friends. That’s what most young people do in real life, and that’s how they learn! And then there’s Harvey–another realistically drawn character. Harvey is the bad boy, the boy girls want to fix. Goodness, knows I dated my fair share of Harveys. While I felt sad for Harvey given the home life he grew up with, I didn’t like him at all near the end. Some of his perverted thoughts about Beth bothered me (even though most young men probably think that way), and he did something that made me question his character. After that particular event, my opinion of him continued to go downhill. I even noted the following while reading: “This guy is an immature a$$hole. He’s more than just flawed. He’s a complete a$$hole. And how old is he? I’d expect these actions from a teen, not a guy in his twenties.” So, that about sums up how I felt about Harvey. When I got to chapter twenty-four, it sort of felt like part two. This is where Beth really starts to grow and where Harvey proves who he really is. His behavior saddened me because he reminded me of people who’ve been dealt a crappy hand in life and instead of working hard to turn things around, they use it as an excuse to treat others poorly. I’m glad Beth was smart enough to do what was best for her in the end.